Lanxess A.G. has completed the move of its headquarters from Leverkusen to Cologne, Germany. With 1,000 employees, Lanxess now occupies the Lanxess Tower at Kennedyplatz 1 in the district of Deutz. The specialty chemicals company will manage its global business from Cologne. 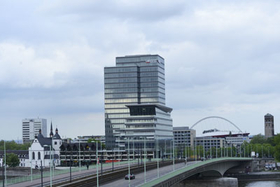 COLOGNE, Germany—Lanxess A.G. completed the move of its group headquarters from Leverkusen, Germany, to Cologne. The new headquarters unites all of the company's central management functions under one roof. The specialty chemicals company marked the event with a ceremony on Sept. 3. Axel Heitmann, Lanxess' chair of the board of management, said the move makes the company more efficient. He added that the tower provides everything the company needs to conduct its global business, especially in the flourishing economic and media hotbed of Cologne. He said the building is equipped with sustainable and responsible architecture, and he lauded Cologne's infrastructure and its reputation as an academic and research center, enabling Lanxess to attract top talent. Approximately 1,000 employees occupy the Lanxess Tower in the district of Deutz. Cologne's Mayor Jurgen Roters believes Lanxess' presence in the city is a significant boost. He said the move is an impressive acknowledgment of Cologne's credentials as an industrial location and serves as proof of the city's ability to attract global players. The 414,000-sq.-ft. building is 22 stories tall (nearly 100 meters) and was completed in three years. It contains a separate conference floor with 13 meeting rooms and a communication center with space for approximately 400. The 2,500 glazing elements in the tower's seamless, transparent facade provide open views in every direction, according to the company. By the time it was completed, 50,000 metric tons of concrete and other mineral demolition waste had been removed from the site. At peak times, more than 400 worked at the construction site. The Lanxess Tower has an underground parking lot, and employees also have access tobicycle stands, and a shuttle bus runs between Leverkusen and Cologne. Meanwhile, Saltigo GmbH, a wholly-owned subsidiary of Lanxess A.G., is moving its corporate headquarters from Langenfeld, Germany to Leverkusen. More than 100 workers will move on Sept. 9 to the facility that formerly was Lanxess' main building. A total of 550 workers are expected at that site in the future. As part of the shuffling, Global Procurement & Logistics L.L.C. will be taking over Saltigo GmbH's Katzberg building in Langenfeld.